Fully customizable to your gym's unique processes. Rapidly identify and respond to member needs and expectations. Streamline and improve route setting and management procedures. Create an interactive online community to meet member expectations and effectively allocate staff. Drill down to plan and execute individualized climbing improvement programs. To climb a grade or two harder requires developing and executing a plan. Use Klimbz to set and track progress. Tick gym routes to create and analyze your performance data. Use Klimbz social networking functions to share beta, images, and provide your gym with feedback on route quality and ratings. Setters and gym managers use Klimbz data to streamline and improve route rotation and setting communications. 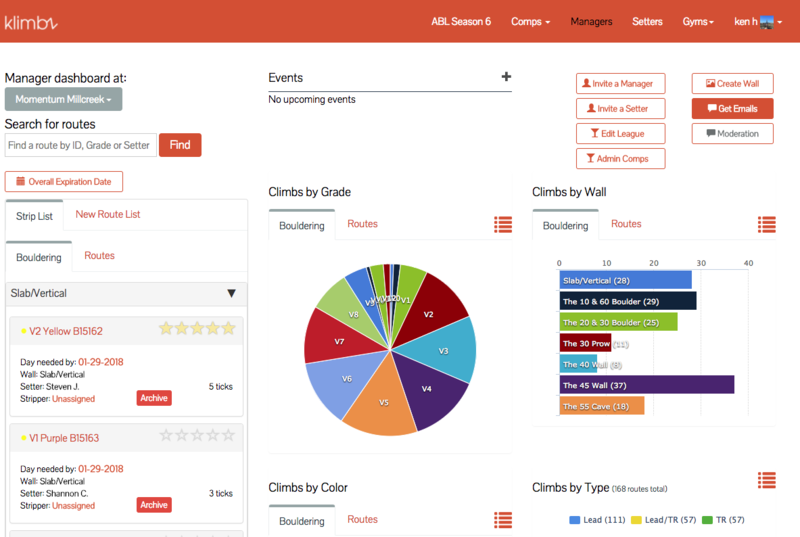 Define priorities and setting goals, automatically assign stripping and setting to individuals, review route feedback and whole gym data, identify member needs and interests around specifics, honor excellent route setters for their route quality and setting effectiveness. Use Klimbz data and interactive platform to provide your gym community (members and staff) a roadmap for growth and improvement. Enhance member experience by using Klimbz to gather and respond to feedback. Provide Klimbz to your members as a tool for setting and meeting individual performance goals, to spark community interaction, and even to create mini-competitions. Provide Klimbz to your coaches and teams to track and manage team and individual performance, set goals, and recognize improvement. Share Kliimbz with your route setting team to manage and improve setting needs and outcomes. Let's make stronger and better climbers. Get in touch with us and we can set up Klimbz for your gym and community. Send us an email - info@klimbz.com and we can set up at time to talk about how Klimbz can help your gym.